First half of the 2013 season is done! All I have to say about the George Wodicka Hook Mountain Half Marathon is that it is very very hilly. Ridiculously so. Leading up to the race, I wasn’t really looking forward to it. Undertrained and not taking it seriously made me feel wholly unprepared. The only thing I was excited about was having the opportunity to whip out the neon pink compression socks once again. These super awesome socks only get used for long runs over 15 miles, and races over 10 miles only…so this was a special occasion! Just a word of advice. Don’t go on an “easy” 14 mile bike ride with your two brothers the day before. These usually turn into a race to see who won’t finish last. Usually it’s not me, but this time it was, but not without some considerable effort to out bike a stranger I was “racing” on the way back. I am not in my 20’s anymore…these shenanigans just won’t fly anymore. This will make your legs feel like two lead weights. Not a good thing to feel when prancing around at the start trying to stay warm in the crisp 34 degF morning. There were only a handful of women dressed in shorts and a t-shirt (in my case, running skirt, t-shirt), the rest were smart. The race has both the 5K and the half marathon runners starting together. It was a nice medium-small crowd, although I overheard one runner comment that it was a bit more crowded this year. So, it was a bit tight for the first two miles as we all jockeyed for space on the path that ran around Rockland Lake. The views were pretty in the morning sun. After 2 miles, the crowd is split with the half marathoners veering off to climb the hills to the outer road. The hill climbs start. The Hook is pretty epic. On my way down, the thought of having to climb back up later made me feel even more tired. This year, due to Sandy damage, we were re-routed North, more rolling hills to Haverstraw….yay! Dirt trail speckled with rocks with some incredible views of the Hudson. I am a bit ashamed to admit, I walked up the Hook. Two miles to go in the race, I ran up as far as I could before I just ran out of steam. Although, I made sure I passed the photographer on course before I walked. At that point it was just faster to walk. Overall, I think it was a great race. A good small local crowd, no frills, just a pure challenging half marathon. Maybe next year I’ll take it more seriously and actually train for it! My race…according to my Forerunner 10! 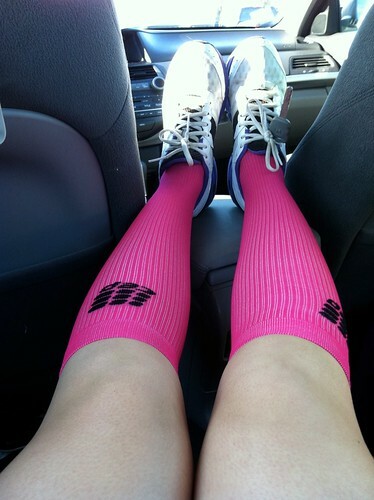 This entry was posted in Running and tagged Compression socks, Hook Half Marathon. Bookmark the permalink.